Successfully Added Magic Stick - Touchscreen Creator Pen to your Shopping Cart. Magic Stick – Touchscreen Creator Pen, turn your laptop into a touchscreen tablet with one touch away. How awesome is that! 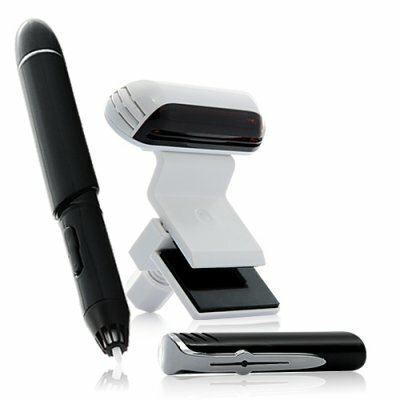 Just clip the small sensor to the side of your existing screen, then use the special stylus pen directly on your screen for handwriting, drawing or as a mouse replacement. You can also clip the sensor to any other flat surface, for example a notebook, and write on it for easy input into your computer! Imagine this: in your sales meeting with a customer, you take out this magic touchscreen creator pen. You paint on the screen to illustrate what benefits they will get from buying your products. Alternatively you can highlight the part in a sales contract that your customer should pay special attention to. Isn’t this a more friendly and convenient way to communicate? Or perhaps you are thinking about buying a gift for a gadget enthusiast friend, or the kids. This will make a great present for its sheer novelty. In fact, you can use one yourself to surprise your friends too! The driver software is in clear, easy to understand English and it’s quick to install. After you finish installation, just connect the sensor to the USB port of your laptop, and start playing! This amazing high-tech gadget is now offered at an amazing wholesale price, and it’s in stock for immediate shipment! Order your sample today. Only by trying it out yourself, can you truly appreciate how cool this product really is. Brought to you by your source for China factory direct electronics – Chinavasion. For higher accuracy, calibrate before using the touchscreen creator pen. Profit from selling this awesome gadget on your online store!